WolfWall is a cool set of new walls that give an extra load of blood and goo to this (still) excellent game by id Software. Hold down [M] when the game is starting to access a jukebox. It will randomly select a list of songs. To get a Gang Screen, choose the window resize option, change the window size, press enter to confirm, then immediately hold down the [I] and [D] keys together. Another way to get the gang screen is to press [I] and [D] at the high score screen. If you do nothing in the game for 30 seconds, BJ will either cross his eyes or stick out his tongue at you. It happens quickly, so you have to watch carefully. You can repeat this as many times as you like. When WOLF3D.EXE or SPEAR.EXE is started with the "TEDLEVEL XY" parameter, where X is episodenumber-1 and Y is levelnumber-1, you'll start in that levelnumbered level. Use UNLZEXE to unpack WOLF3D.EXE and edit WOLF3D.EXE with a hex editor. With this next patch you won't see the blasts when the Nazis shoot at you, those blasts are pain. When you use god mode and a lot of guys shoot at you at the same time the whole screen goes red. With this patch you will still be hit if you don't use a patch for health or god mode. Use UNLZEXE to unpack SPEAR.EXE, then edit SPEAR.EXE with a hex editor. In the help section of Wolfenstein 3-D v1.4 shareware version, there are a couple of quotes from the creators of the game. 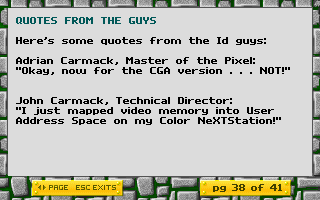 Adrian Carmack, who did the graphics, said: "Okay, now for the CGA version . . . NOT!" 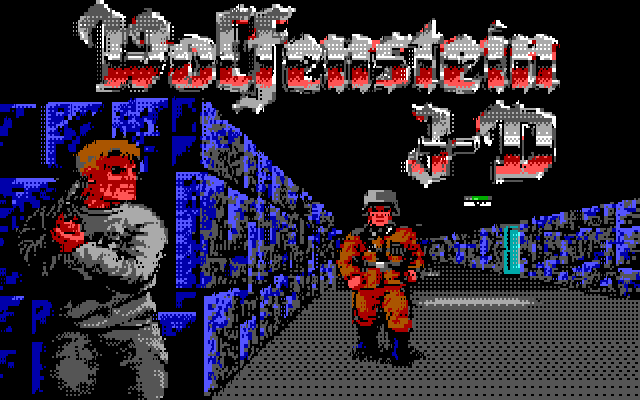 This demo shows what a CGA version of Wolfenstein 3-D could have looked like. 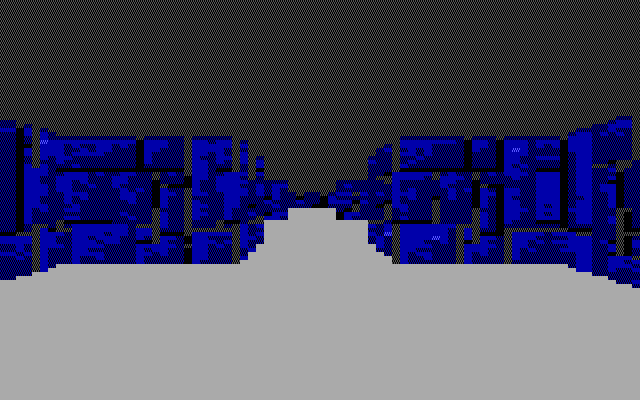 Download Wolfenstein 3-D in CGA, source code in C with inline assembly included. CGA version? I accept that challenge. Here are two screenshots of the demo. The first one shows the title screen. The second screenshot shows some texture mapped raycasting action. And here's a video of the whole demo. "Cool will have to check it out sometime soon." Wolfenstein 3D News News about Wolfenstein 3D. Diehard Wolfers Forums A Wolfenstein 3D forum with lots of sections. WinWolf3D is a Windows port of Wolfenstein 3D. You can also find a new editor and a mod here. Wolfenstein 3-D - ModdingWiki Information about the file formats of the Wolfenstein 3D data files. Pixelmusement - Ancient DOS Games - Episode 63 A video review of Wolfenstein 3D. LGR - Wolfenstein 3D - DOS PC Game Review A video review of Wolfenstein 3D. Wolfenstein 3D Episode 1 at TASVideos A tool-assisted speedrun of this game. Wolfenstein 3D Director's Commentary with John Carmack John Carmack talks about Wolfenstein 3D in this video. Mortyr 2093-1944 While id Software started working on futuristic shooters, other companies continued with the nazi theme. Apogee The publishers of Wolfenstein 3D. id Software The creators of Wolfenstein 3D. Planet Romero A creator of Wolfenstein 3D. He has some very old pictures of Wolfenstein 3D and he has got his own forums where you can talk with the author. The Tom Hall Press Wolfenstein 3D designer. Bobby Prince composed the music for Wolfenstein 3D and Spear of Destiny. Spear of Destiny at MobyGames Spear of Destiny's entry in the game database. Spear of Destiny at Wikipedia Spear of Destiny's entry in the free encyclopedia. Wolfenstein 3D at MobyGames Wolfenstein 3D's entry in the game database. Wolfenstein 3D at Wikipedia Wolfenstein 3D's entry in the free encyclopedia.